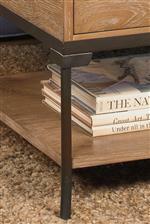 Featuring bronze metal legs and hardware, this end table has a distinct industrial feel. Subtly shaped legs put a feminine twist on a typically strong style, and the lightly distressed Aged Cappuccino finish gives it a warm and rustic appearance. One drawer and one shelf provide simple chairside storage. The 2013 Rectangular End Table with Metal Legs by Null Furniture at Westrich Furniture & Appliances in the Delphos, Lima, Van Wert, Ottawa, and Celina area. Product availability may vary. Contact us for the most current availability on this product.